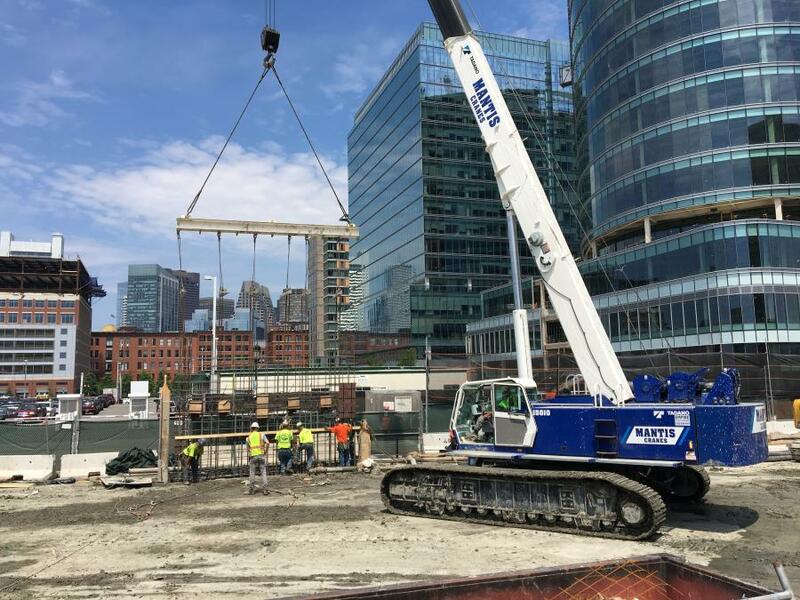 Used for pick and carry situations, this Mantis 15010 77-ton hydraulic boom crawler crane has been a good fit for Treviicos. Here, the crawler is being used to drop a slurry wall cage. The Seaport District of south Boston has experienced explosive growth over the past decade, and with the announcements of General Electric moving its headquarters and Amazon building a major facility in South Boston, the growth rate has achieved even greater levels. 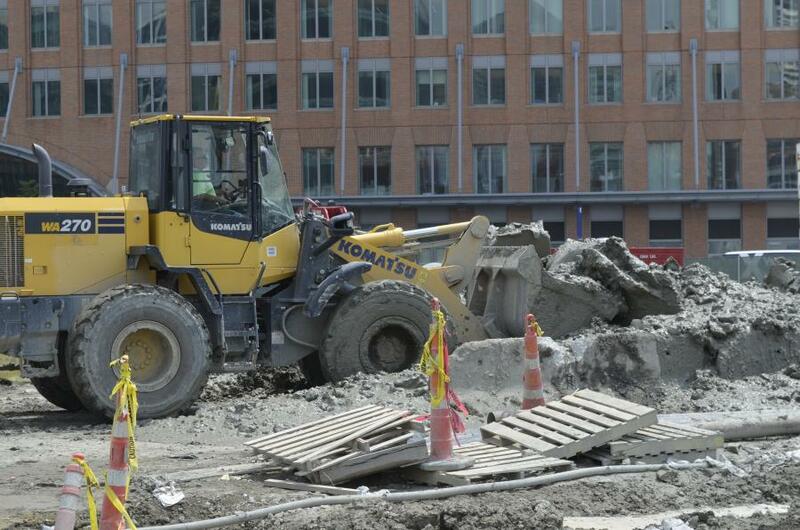 The current level of construction in Boston is rivaling Big Dig levels. Among the major projects currently under way is the $900 million mixed residential and commercial project at 145 Seaport Blvd.. This project, owned by California's Cottonwood Management, includes three mixed use towers containing 1.3 million sq. ft. constructed on a 3-1/2 acre parcel. Two of the towers will contain more than 400 combined luxury condominium residences, and the third tower will contain 733 luxury apartment residences along with 125,000 sq. ft. of retail and restaurant spaces. Residential amenities will include two signature outdoor pool areas, an indoor pool, expansive sundecks, courtyards and oversized private terraces. Construction on this project began in January 2017 and completion is anticipated in early 2020. The slurry wall construction of this project has been awarded to Treviicos, the North American subsidiary of Trevi. Treviicos was set up in 1997 when Trevi's underground engineering and tunneling division purchased ICOS Boston, a company with a 40-year history in the United States. The two company names were combined to form Treviicos. 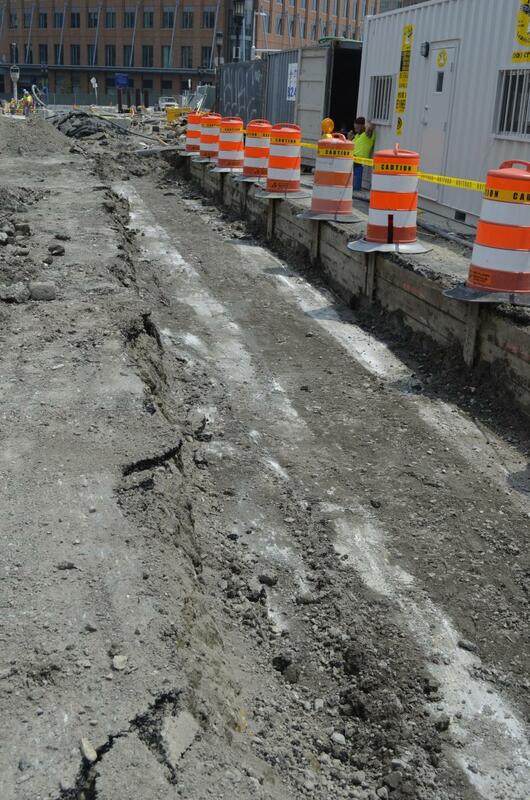 ICOS Boston had specialized in the slurry wall foundation construction process. This process made possible the construction of hundreds of infrastructure projects and many noted buildings, including the original World Trade Center, according to the company. In 1997, the newly formed Treviicos was awarded the contract for the construction of the complex foundation system of Boston's new Southeast Expressway, better known as the Big Dig. With the completion of the Big Dig, Treviicos was able to capitalize on the flourishing Boston economy and was intricately involved in the construction of many new hotels, condominiums and office buildings, as well as medical and educational facilities. While Treviicos is widely diversified, the core of its reputation in New England was built around slurry wall construction. 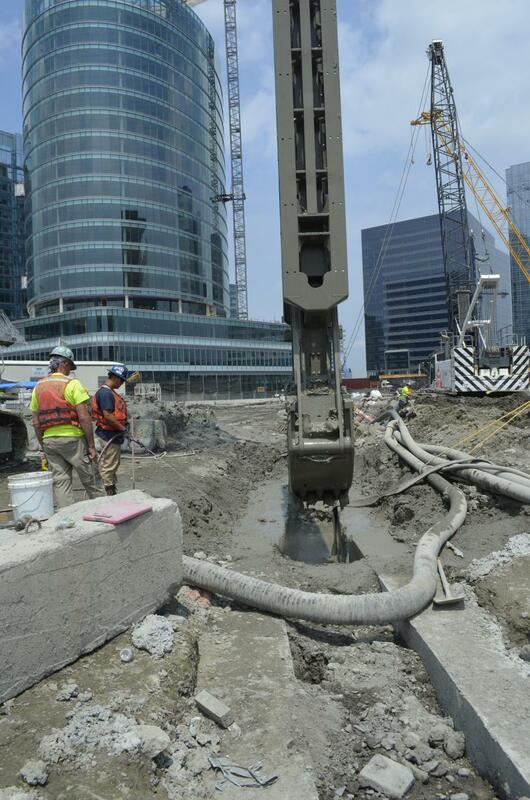 On the Seaport Boulevard project, Boston's Silver Line subway tunnel dissects the job site at depths ranging between 18 and 40 ft. below the surface. This had to be taken into consideration in the engineering and design of the slurry wall when the tunnel area comes into play. As a result of this, a slurry wall runs parallel to the tunnel area on each side of the tunnel. Before construction of the actual slurry wall begins a concrete guide wall is laid out and built. Upon completion of the guide wall, excavation for the slurry wall begins. Massive clamshell buckets, which are controlled by very specialized cranes, start excavating the dirt and stone between the areas outlined by the guide wall. 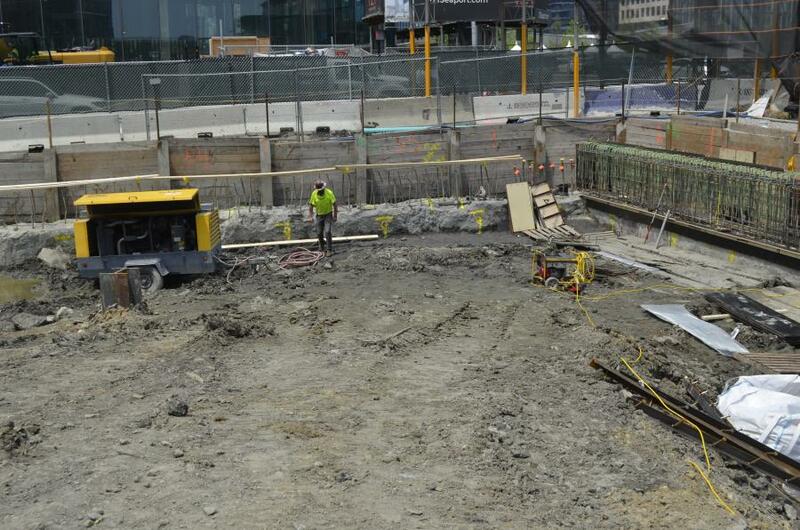 The excavation at times will reach depths up to 90 ft.
A crane-operated clamshell bucket is used to excavate material within the boundaries of the guide wall. 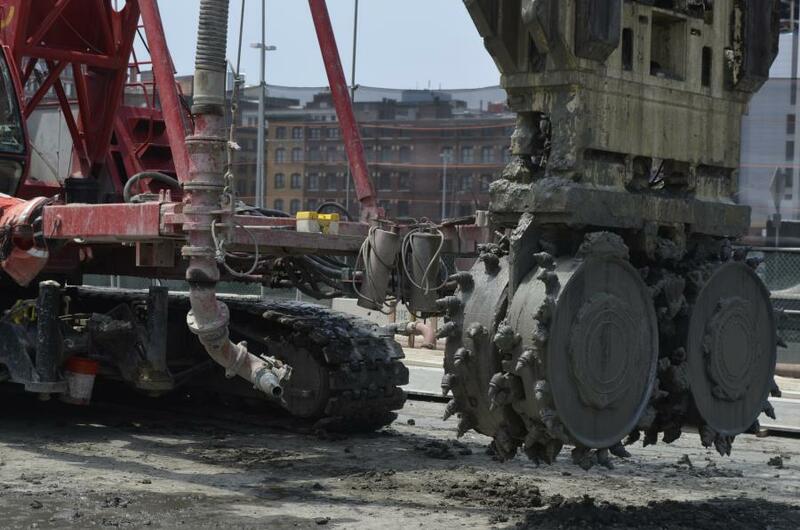 At times, rock is encountered during the excavating process that cannot be removed using the clamshell bucket. In this scenario, crane-operated grinders, which are capable of breaking up even the hardest New England granite, are dropped into the hole. 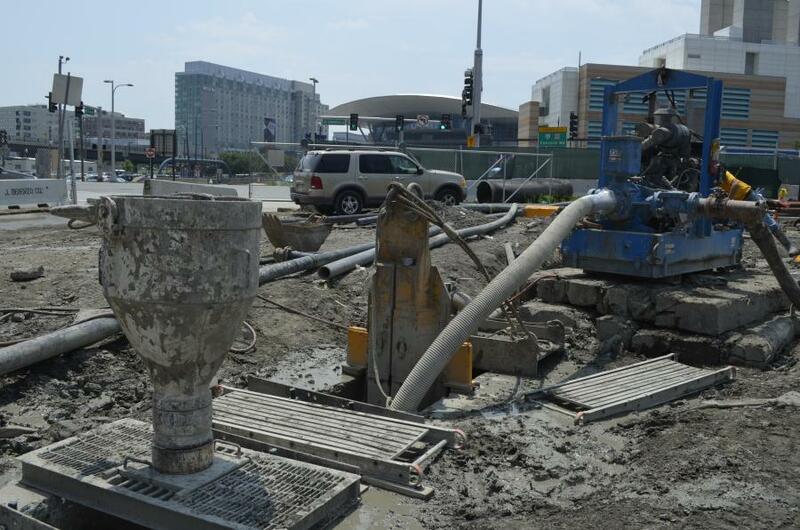 Once the foundation has been excavated, slurry composed primarily of water and Bentonite is pumped into the hole. This mixture helps maintain the integrity of the walls of the hole until concrete is poured. 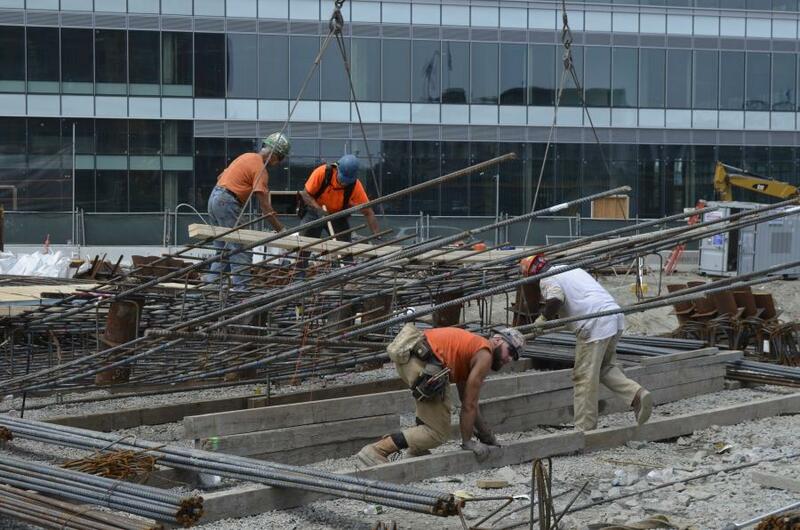 With the slurry in place, 22-ft. wide steel panels manufactured from reinforced steel, which resemble a rebar cage in design, are lowered into the foundation and are sealed together. 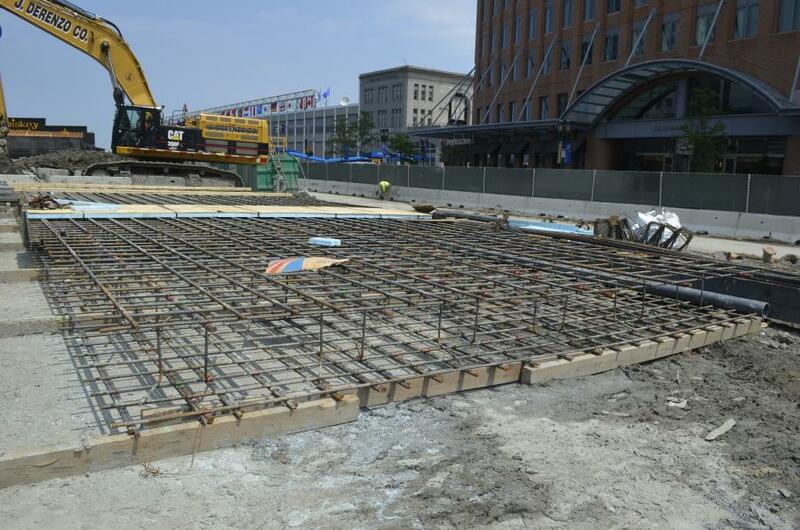 Each panel weighs between 30,000 and 75,000 lbs..
Once the panel walls are in place and have been sealed together, cranes are used to place concrete funnels that are as long as the depth of the dig into the hole so that concrete can be poured. 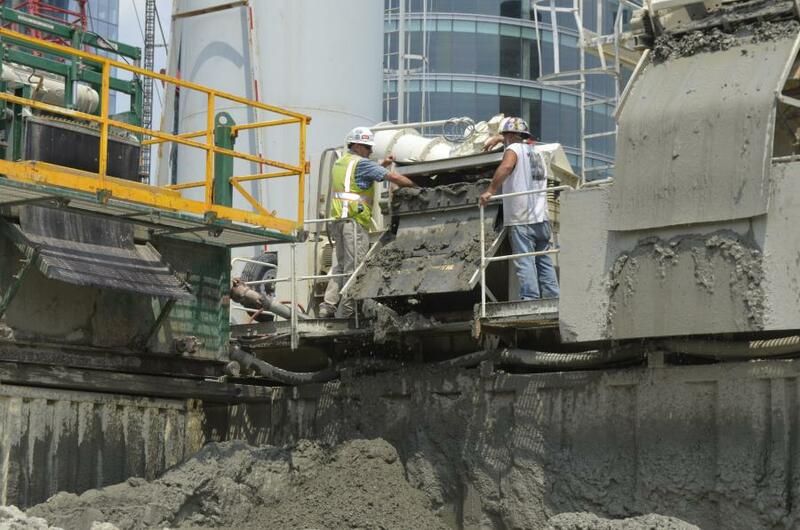 Once the concrete is poured into place at the bottom of the hole the lighter slurry mixture of water and Bentonite displaces to the top of the hole and the slurry is pumped to a screening and separation area. The construction of a slurry wall is crane intensive work. 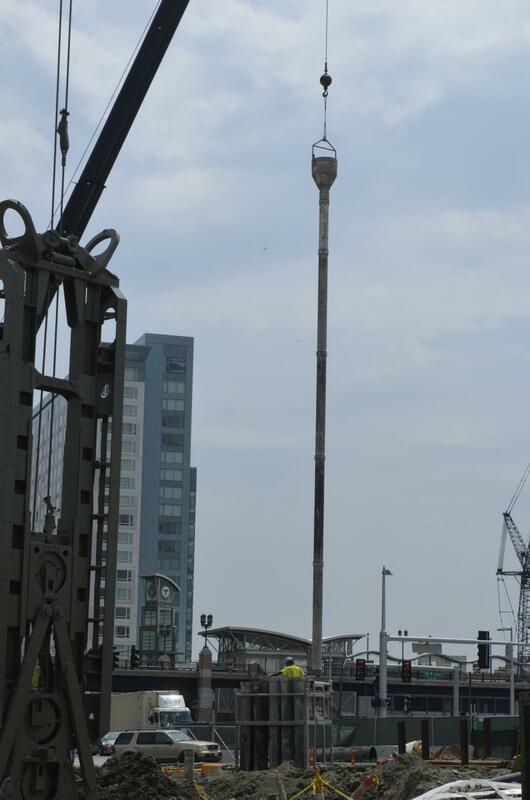 The cranes that Treviicos uses for the lifting of the clamshell buckets and diggers are duty cycle cranes manufactured by Liebherr that the company has modified for its specific application. For the hoisting of the rebar cages into the excavated holes and doing general pick and carries around the site such as unloading rebar, Treviicos selected a Mantis 15010 77-ton hydraulic boom crawler crane from Empire Crane headquartered in Syracuse, N.Y.
“[The Mantis 15010] perfectly fits the specs we are looking for in this application. It offers tremendous stability and the best maneuverability possible in this application. It has 111 feet of boom, which is all hydraulic. We had previous experience with the use of this crane on a major casino project that we were involved in that contained very tight quarters. With no outriggers, the machine reaches its full capacity in a very small footprint,” Taylor said. For more information about Treviicos, visit www.treviicos.com. 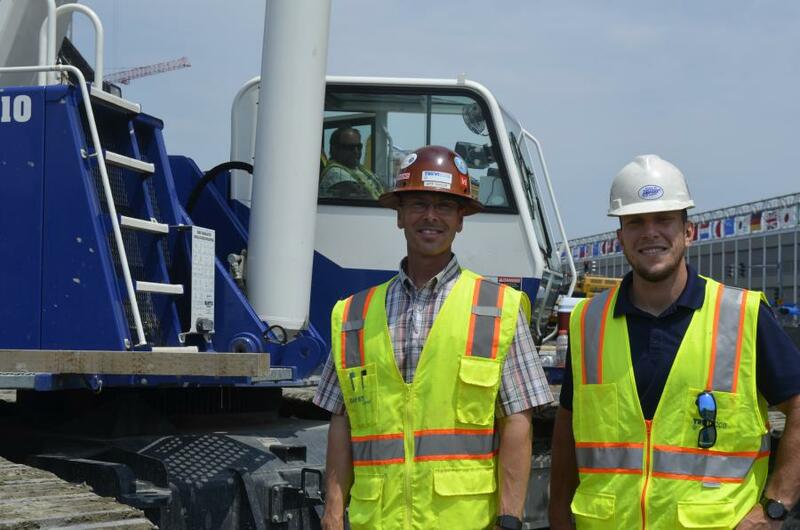 For more information about Empire Crane, visit www.empirecrane.com. What Is a Slurry Wall? A slurry wall is a system that can provide lateral retention, load-bearing capacity and waterproofing to a foundation while becoming part of the permanent structure. It can be built with zero clearance to existing structures, act as under-pinning of superficial foundations and in conjunction with pre-founded columns, constitute the perimeter wall in top-down construction projects. Slurry walls are very versatile — they can assume any shape, with thicknesses varying from 2 to 5 ft. and depths of up to 400 ft., and can be constructed in any imaginable soil condition.